There’s no doubt fasting is ‘in vogue’ these days. Public figures from celebrities like Hugh Jackman to the former Evernote CEO Phil Libin have publicly touted the benefits of fasting for their own health. But is this just another ‘fad’ diet? Will these people realise weeks and months down the track that they’ve stuffed up their metabolism and lost control of their eating? Let’s have a closer look. First of all, what exactly IS fasting? Fasting is the voluntary abstaining from food for a given period of time. The reality is, unless you are a newborn baby, or you set your alarm to wake every three hours overnight to eat, we all fast every day. We as humans, along with other animals, have evolved to ‘feast’ or eat until we are full, when food is available and in between feeding times, to draw on our body’s own energy stores (in the form of glycogen in our muscles and liver) and stored body fat. This is a natural process we’ve been doing for thousands of years. What’s NOT natural is to eat a high sugar’ed meal from the minute we step out of bed, then continue to eat every 3 or so hours during the day, every day for several decades! But unfortunately this scenario isn’t all that uncommon these days. As a species, humans have fasted in some shape or form for millennia – whether it be through necessity that they were waiting to catch their next meal, or for spiritual or religious reasons. It’s not difficult to think of examples of religions who regularly incorporate fasting. The Christian Lent 40 day fast and the Muslim Ramadan fasting month are two that spring to mind. Ok great, but we don’t live thousands of years ago. We live now. Why put ourselves through the torture of fasting if we don’t need to? Good question, and one that I myself used to ask. But you don’t need to look far to see the reasons why encouraging people to be more embracing of fasting might be beneficial. The rates of obesity, diabetes and other lifestyle related diseases continue to escalate at an alarming rate. This is inflicting major stress on our healthcare systems. And despite decades of advice to ‘eat less and move more’, the situation doesn’t seem to be getting any better in a hurry. Fasting can be a simple way to reduce the burden of all of these diseases. Some people need to be a bit more careful with fasting and will need the supervision and advice of a knowledgeable doctor, particularly for more extended fasts. They include people on regular long term medications (for example diabetes and blood pressure medication) and people who might have a history of binge eating or any other unhealthy relationship with food. Fasting for these people isn’t necessarily a bad thing, and in fact often times can be beneficial. It just needs to be done with care and appropriate professional support. Now to the health benefits of fasting. As soon as 3 hours after you finish your last meal, your insulin and blood sugar levels come down. And if you are trying to lose body fat, believe me, this is a good thing. Why? Because bringing your insulin down finally gets your body a chance to tap into any excess fat stores for energy. And this will eventually reduce your waistline. The metabolic improvements of short term or intermittent fasting have been well demonstrated in the scientific literature. Longer fasts lasting more than 1-2 days also seem to have benefits for the health of our cells individually. Evidence suggests that longer fasts promote the ‘killing off’ of old and damaged cells through processes known as ‘apoptosis’ and ‘autophagy’. Indeed a prominent researcher, Yoshinori Ohsumi won a Nobel Prize for his work in this area. The effect is like a whole body spring clean. However, longer fasts should only be done with the supervision of an experienced doctor. How do I fast? How do I actually eat nothing? The time elements of the fast, as in how long you might fast for and how far apart one fast might be from the other. First let’s look at point one – what can and can’t be included on a fast. 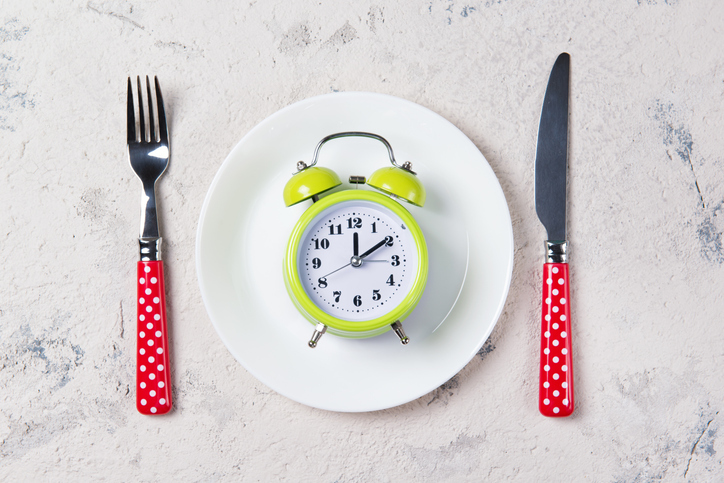 It is beyond the scope of this introductory article on fasting, but fasting enthusiasts have been known to manipulate elements in the diet to provide the desired fasting effect. For example, some people will undertake what is known as a ‘fat fast’ where oils like olive and coconut oil will be consumed, but minimal protein and carbohydrate. Physiologically this has a minimal effect on insulin, MTOR and other nutrient sensing pathways, but calories are still being consumed so it is, by definition, not a true fast. Sometimes fasters will have bone broth or coffee with a dash of cream, with the rationale being that the small amount of calories consumed won’t be enough to ‘break the fast’ from a physiological point of view. Most commonly in practice, health professionals who use therapeutic fasting for their patients will generally allow fluids like black coffee, tea, herbal teas, clear soups and sparkling and still water. Keeping hydrated is extremely important on a fast. Fluids like diet soft drink are a ‘no no’ as they tend to still produce an insulin rise in the blood stream (despite the lack of actual calories in them). Let’s consider the second point – how long to take your fast. The simplest and most natural way to start off is to ensure you have at least 12-13 hours overnight fasted. Some studies show health benefits of even this slightly prolonged fast (including reduction of breast cancer recurrence in one study). This is often what I will get patients who are completely new to fasting to do. I then might encourage them to stick to their 3 ‘square’ meals per day, rather than snack between meals. This is simple to do, often times not particularly disruptive to their life, and really gets people to be more mindful of their eating and snacking. Advantageously, it gives their insulin a chance to come down in the 5-6 hours they will be having between meals. From there, you can take fasting further if you wish. One popular method is ‘Time restricted feeding’ which ensuring you consume all your food in a 24 hour period over a period of 8 hours and have the remaining 16 hours fasting (as in, only consuming ‘allowed’ fluids). You might do this 3 or 4 days per week. Let’s face it, saving half an hour on a busy work morning not worrying about breakfast could be a good thing! The other element relating to time which people often don’t consider is how close together to run any two particular fasts. For example, you can get superior health benefits to doing two consecutive 24 hour fasts (for example where you have dinner on Monday and Tuesday night, but nothing during the day on both of those days). This has been outlined brilliantly in the ‘What the fast’ book by Caryn Zinn, Grant Schofield and Craig Rodger. Another protocol could be running 16:8 fasts on 3 consecutive days which can also have really good health benefits. In fact there is almost no limitation as to how you can structure fasting. Apart from the obvious fact, that all fasts will eventually come to an end when you eat, which will bring about the required cell replenishment. Like all things in life, there needs to be a sensible balance between ‘feasting’ and ‘fasting’. Too much of either is not a good thing. Fasting is a highly effective, cheap and simple tool we can use to improve our health. However, it is almost looked upon in horror today in our 24-hour food availability, Uber-eats modern lifestyle. My advice would be, that if you don’t have any excluding health conditions and you’re interested in trying a cheap and simple method to improve your health that has an impressive array of science to support it, to give fasting a try. Start off slowly and tread gently. If you’ve never fasted before, simply try to delay the time you have breakfast even by a few hours then have a nutritious meal. You’ll be surprised how good you feel even doing this from time to time. From there, you can take fasting wherever you want to, depending on your health goals. Good luck and keep me posted how you go!